Orphea is the first Hero officially born in the Nexus. She isn't linked to any other IP in any way, and that places her in a unique position. It's clear from her design that Blizzard have gone to town on not only making her unique, but also powerful. While there's no mistaking that she's overtuned, she's also challenging to play, with a kit that offers a geat deal of utility, burst, sustain and zoning. In the right hands Orphea is terrifying, and can comfortably wipe a team if she chains her abilities together. Unsurprisingly, she does have some weaknesses (notably a lot of dive) though this can be countered through effective drafting. Either way, Orphea is a potent ranged Assassin that's first ban material, which puts most of her peers to shame. 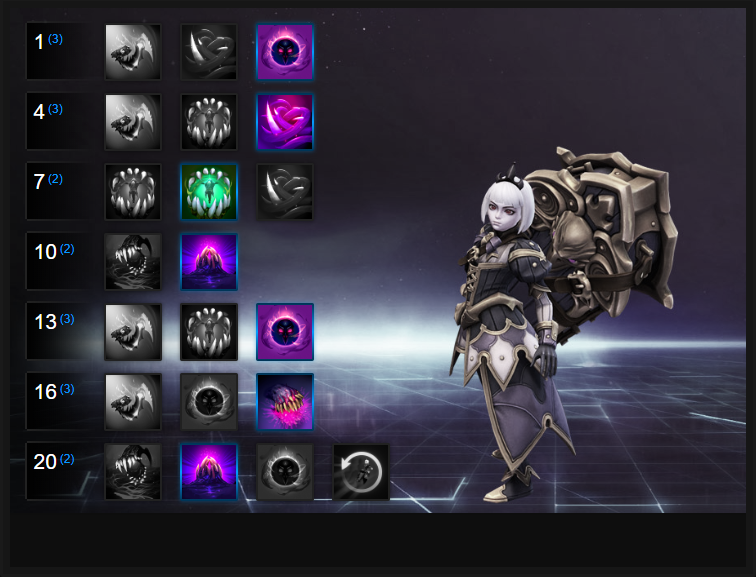 Overflowing Chaos (Trait) – Orphea's Trait allows her to stack Chaos up to 3 times. She can then consume the stacks to considerably boost her basic attack damage, while also healing herself based on 100% of the damage dealt. Ideally you want to be saving your basics for when you're fully stacked, so that you can unleash your empowered basic at the end of your ability rotations. Shadow Waltz (Q) – Shadow Waltz is unique, in the sense that it causes an additional effect only after you land it. With a fairly lengthy range, landing it deals damage to all those under the spike, refunds mana, lowers its cooldown, and allows Orphea to dash in a direction of her choosing. If you can't, try not to miss. Doing so will leave you with a hefty cooldown, and no means of escape. Dread (W) – Allowing Orphea to slow those at the end of Dread's area, it's a skill-shot ability that has a fairly long range. What's important is to fact in its end location, not neccesarily its path, as the eruption at the end of its travel time is what causes the crowd control and damage. It's definitely worth hitting the training area to play with the ability off cooldown, so that you can get a feel for its travel time, and the delayed explosion. Chomp (E) – A super-short ranged attack that deals high damage to all those infront of Orphea, Chomp can cleave an entire team if they're grouped together enough, but be aware that its range really is tiny. If you're to maximize its damage potential, you'll need to zip towards enemies with a Shadow Waltz, or keep them houses long enough with Crushing Jaws to unleash it. Eternal Feast (R) – A heroic you likely won't use often due to the strength of Eternal Feast, it still has its uses on Battlegrounds where you fight over a set location. With Eternal Feast lasting indefinitely, its real value is zoning the enemy. If you're pushing an enemy structure (say, with a boss) and drop Eternal Feast at the entrance, it'll buy your team significant time to deal damage. Eternal Feast also pairs exceptionally well with Maeve and her Warden's Cage. The damage potential is ridiculous. Crushing Jaws (R) – Without doubt her strongest Heroic, Crushing Jaws allows Orphea to pull enemies towards a central location, deal damage, and stun. In a team fight, and if she's close enough, this not only allows her to deal massive damage to her opponents (that's unavoidable), but it also ensures her team can collapse on the target location. If you can, try to ensure you've all your abilities ready for when you deliver it, as you can immediately unload them all while players are trapped. Ancestral Strength is incredibly strong, as it allows Orphea to deal 25% increased damage against targets that are slowed, rooted or silenced. Considering Dread slows enemies, and with Talents, slows all enemies in its path, Orphea by level 4 can gain a massive damage spike early game. Allowing Dread to slow all enemies in its path (rather than just at its eruption point), Fright's slow stacks up to 50%. For zoning, escaping, locking down enemies, and generally being a nuisance, it's amazing. Ravenous Hunger allows Orphea to permanently increase the damage of Chomp based on the minions or Heroes she kills. A minion grants 2 damage and 60 health (to Orphea), or a Hero grants 40 additional damage and heals Orphea for 25% of her maximum health. For sustain, eye-watering damage late game, and pure burst potential (which feeds into your level 1 Talent), it's a must. A no-brainer when it comes to team fights, Crushing Jaws faciliates much of Orphea's burst potential. Catching multiple enemies in it, in a team fight, can almost always ensure you win. Not a must-have Talent, but one that does allow for additional burst. Effectively making your Trait an active ability, Invasive Miasma offers a delayed AOE that deals high damage, but also heals and provides Chaos to Orphea based on who she hits. Activated before your Heroic, it's another layer of damage. Lurking Terror effectively provides two charges of Chomp to Orphea. When casting Dread, she can use her active Chomp ability to cast it from the location where Dread ends. Effectively, this lets her poke with Dread, and erupt a Chomp from where it stops, providing her with poke and burst from afar. Sexxing up Orphea's Heroic, Engulfing Oblivion allows it to reduce the armor of those struck by 25, and also sets its cooldown to 5 seconds if it kills a Hero. Awesome. This list of tips and tricks are just a handful of things we think will help your Orphea play. We'll continue to add to the list as required and if you have any tips you'd like to share, let us know in the comments below and we'll place them here. 1. Shadow Waltz has a reasonable cooldown if you miss your target. You really can't afford to, as the cooldown reset provides amazing mobility, while landing your attack allows you to dart in any direction you choose. 2. Remember that Shadow Waltz has a slight delay before the blade hits the ground. Factor this is, and be ready to dash when it lands. 3. Dread deals very little damage on its way out. Its damage comes from the delayed eruption almost a second after it reaches the end of its path. Factor this is when firing it off. 4. With Talents, Dread slows all those caught in its path. Use it to lock down high value targets when they're trying to escape. 5. Shadow Waltz combined with Chomp, when an opponent is too close for comfort, offers massive burst and an immediate escape. 6. Try to zip towards your enemy when you've trapped them in Crushing Jaws, so that you not only hit a powerful basic attack (with full Chaos) but also land Chomp against more than one foe. 7. Chomp is great for clearing large minion waves in a pinch. 8. It takes 1.25 seconds for Crushing Jaws to activate, so try to slow players so that they'll struggle to escape it. Also, the moment the jaws close immediately cast your Trait, Chomp, Lurking Terror and Shadow Waltz for an outrageous amount of damage (it takes some practice). 9. Orphea has a fair amount of sustain across her abilities and thanks to her Trait. Use your fully charged basics to keep your health topped up. 10. Remember that you're still weak to dive, even with Shadow Waltz. A good Diablo can keep you locked down before you even fire off an ability.